Copy/paste the 4 questions below (in blue), to your post & then answer them. a) Which are your favorite National Teams by the order? b) Which 4 teams will be the top 4? c) Write down your comments & analysis on the 2006 World Cup (if any)? d) Bonus question: Which is your favorite Iranian first division league, soccer team? Once the preliminaries are over & all 32 teams are decided, then we will make a poll on who will be the WC 2006 champion, so you can vote in it. Let me start the first post in this thread. In regards to the questionnaire (4 questions). I believe it is too early to respond to them. I need more time/info to do analysis. Preliminaries are not even over & the 8 groups are not decided yet! Later on, I am going to answer the questionnaire above. "Argantina!! What kind of team is that. They have been dead for a few years. Germany will win this one playing against Brazil in the final. 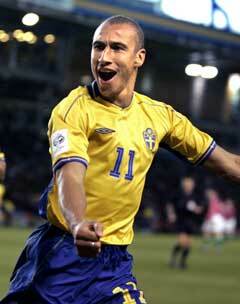 I would like to see USA do very well as well." Man, check it out, I did not ask you who will win the cup, but I have asked you which is your favorite team? What is it with you that you always want to stick with the winner? You are what is called: "The Seasonal Fan"! The Seasonal Fans are the worst fans a sport team can have! Every season, you jump in the strong team's arms! I also notice that somewhat you do the same in politics! Now the first one is called Sports Opportunism & the second one is called Political Opportunism! Myself, I am not a seasonal fan. I stick with one department store, one barber, one tailor, one brand, & definitly one favorite team all my life. Rain or snow, good times & bad times, win or lose I make the conviction & due to my principles I stick with my team. Since I was in elementary school, my favorite Iranian Soccer Team was "Taj" Tehran (Esteqlal) & my second team was "Malavan" Bandar Pahlavi. In addition, I always respected "Pas" Tehran as a worthy team but I always despised "Persepolis" with a full passion! Since 1974 world Cup in Germany, I became a hard-core Argentina fan. That year, they did not even do anything amazing, Dutch beat them badly. 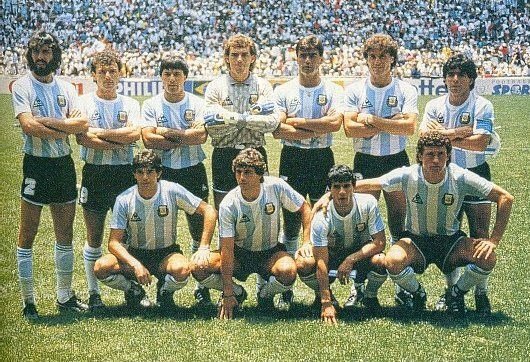 But next cup, 1978 Argentina, they won the championship & they destroyed the Dutch. Since then, win or lose, I follow Argentine soccer & I am a Argentina Fanatic. 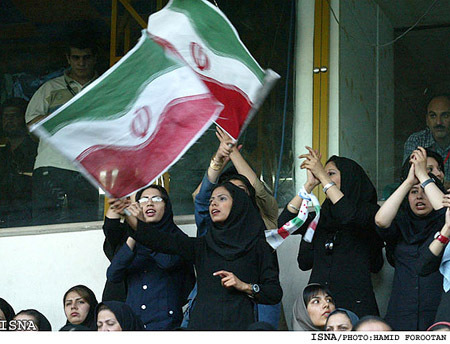 After Argentina, of course I like America (Home Team) and indeed Iran. However my love towards Iran, since it has become Islamic Republic of Iran, had declined! 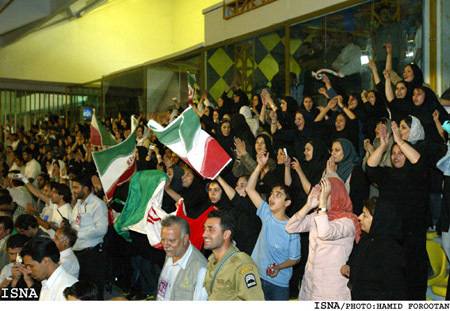 For instance, when USA played Iran (that famous cup), I was a fan of USA (eventhough they lost)! I cannot stand Dutch (Holland) & I have mixed feelings mixed with hatred for Brazil, because I am into South American Soccer & Brazil is always the main competitor to Argentina in the "South American National Championship" and in the World Cup! I am pro South American Style of soccer rather than European. As an Ex-Football Player (Inside Line Backer) in College & Semi Pro (Local County League), I love Football. I have been a Pittsburgh Steelers fan forever. When I lived in Philly or now in San Diego, I had never rooted for the home team & I was always in trouble with the home fans, yet I always stuck with Steelers. Steelers has been a steady powerful team in NFL forever! They always go to playoffs, they almost always go to AFC Championship & sometimes to Super Bowl but they lose! So far they have won 4 super bowls (Ancient History) but last year we almost done it & I have a good feeling about this year! It is too early for me to give you my top 4 World Cup Soccer favorites for 2006 & it is also too early for me to give you an analysis. Later on would do. So as you see, I stick with my teams forever. Maybe you need to get some conviction, make a decision & stick with your teams, rain or shine! Stop jumping in winner's arms! Have consistency! So if you can answer the above questions, then go for it. Well alrighty then, I am back to predict! After vast analysis & much pondering, I have come to this conclusion. Here are my predictions for the the 1st round of finals. I believe it is too early to go further than this. Teams in red will be eliminated @ the 1st round. So there you have my predictions Folks, what say you? I'm not an avid football fan but when it comes to World Cup I suddenly become very keen on following the games!!! I also enjoy watching certain international games. I also love how the South American style of PLAYING football! I have a weird attachment to Brazil, so much so to that I think I would support their team over my own home countries team!!! and I've never even visited the country! I've met Brazilian people though and they're really great people! Or maybe I should be given a traitors award for not supporting my fatherland and/or motherland!!! Secondly, if it came down to a game between Sweden vs Iran I would probably hope that Iran wins just because I feel so bad for the whole situation in that country!!! Last comes Italy who also has a nice game play, not on par with the Brazilian, but i've seen some worthy performance from them! I'll leave the football babe out on this one!!! Your information is outdated. That is not the Iranian Flag anymore! The name of the country & everything else had changed! Islamic Republic of Iran is the new name! and even a few Bonus photos of Iranian Old-Timer Soccer Babes! Eat your heart out, but don't get indigestions! 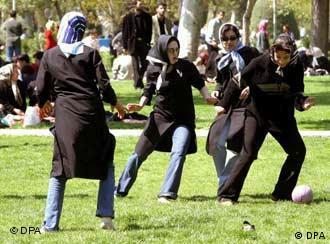 Islamic Republic of Iran's Soccer Babes! Sakineh: Shame on you Lib! 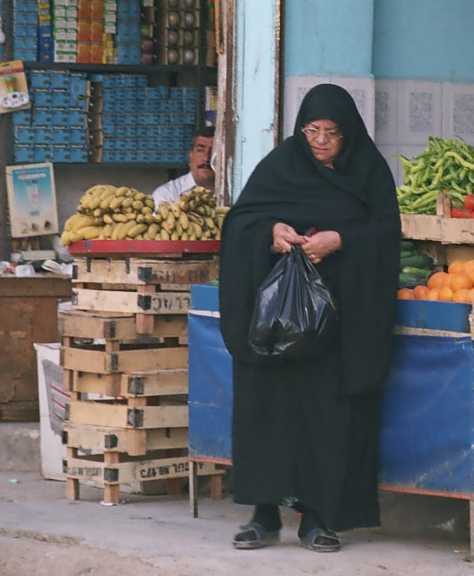 Stop peeking under my chador! Soqra: Where have I put my game tickets? Kobra: Allah has blessed the IRI's Team! Ozra: Go IRI, Go....., Hey Lib, Give "Good Ol Ozi" a French kissy poo! Pucker up a smoocher, you young viking hunk! I hate you! loool you just had to ruin my football babes like that didn't you! Did someone say they support Argaytina???? The 2006 World Cup Champ's? Iran and USA are given, but I really started rooting for the Argentines after I spent some time there practicing Spanish, its an amazing country! The soccer passion runs deep....you have to watch a game in that country and I GUARANTEE it will be an experience like no other. I went to see Boca Juniors play (four times actually) at their stadium which is nicknamed the 'Bombanera,' which means 'Chocolate Box' in Spanish because of its compact size, and my ears nearly blew out after 90 minutes! The stadium is really historic, Maradona still comes to the games (Eric Cantona was at the last one too), and the stadium is in the GHETTO so the fans only have Boca Juniors going for them! I went with a BRAZILIAN and an BRIT and they both said the atmosphere at a match in Argentina was nothing compared to what they had seen! I have never seen a game at Azadi Stadium, but if a Brazilian (Corinthians fan) and a Brit (Arsenal fan) both say Argentine soccer is too crazy and passionate even for them, then I would have to say Argentines are the craziest soccer fans in the world, and I love them for that! As far as the World Cup goes, I think Argentina, Brazil, Holland, and possibly England will go far. Iran and USA can possibly advance to the second round, but I wouldn't expect much more. 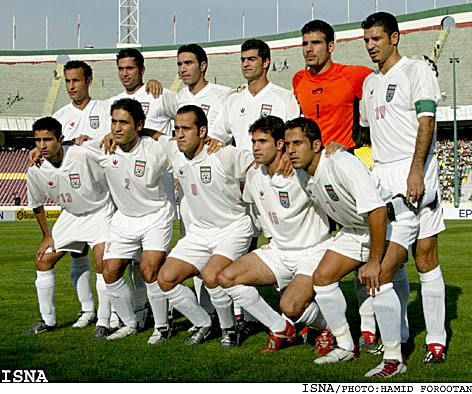 With best wishes for the Iranian National Team in the 2006 World Cup! Football without Argentina is like Noon without Kabob! I like both Argentina women and Men National Teams and I like River Plate in Argentina Primera Division. Did I forget or have I mentioned I am an Argentina fan? You have a bad choice in teams.....I am a huge Boca Juniors fan, you may know Boca Juniors as the best team in Argentina AND this years Champions. River Plate fans are a bunch of stuck up, fair weather fans. I suggest you leave the Dark Side and join the people's team, Boca! World Cup 2006 has officially started. The Grand Opening Ceremony is broadcasting NOW! Who will win 2006 World Cup? Due to the Grand Tragedy of elimination of the great Argentine team by the weak German team, based on Mordeh Khori (Penalty Kicks), I send my condolences to all the great football fans. I am still in state of shock and denial. Knowing Ahreeman, at the time he is alone and somewhere in the world, in state of depression and likely to remain in this state for weeks, wearing black and moping over this tragedy. In his depressive states, he can also become very violent (like Argentine players at the end of the game). We must mourn this tragedy by hanging black flags in this room and streets of IPC. We might even throw a number of Rouzeh Khani, Sineh Zani and Taziyeh (Ashura Style) for this great tragedy. For convenience of mourners and ease of crying, we will distribute large posters of Imam Tevez, Imam Requilme, Imam Sorin, Imam Crespo, shreded poster of Imam Ayala (who missed the penalty) and Grand poster of the martyred injured Goal Keeper Imam Abbondanzieri, whom his injury and not presence in the Argentine goal, caused the defeat of Argentina. Azaa Daaraan may continue the "Argentina Azaa" for 10 days.